With travel being increasingly accessible, even to students and young people without a lot of money, hostels are more popular than ever before. These low-cost forms of accommodation offer the best room rates and lots of fun freebies like Wi-Fi access for all guests and complimentary breakfasts, but being kind to your budget isn’t the only advantage of staying in a hostel. These locations also often feature many relaxing communal spaces like living areas, kitchens, game rooms, patios, and more, allowing guests to feel right at home and relax with books, games, computers, and good company, even having the chance to make some new friends. Iceland is an increasingly popular tourist destination that has really seen a huge surge in tourist numbers over the last few years as more people learn about this beautiful tiny nation. 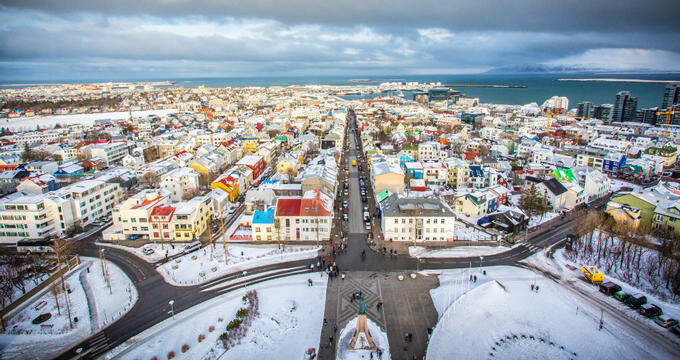 The capital city of Iceland is Reykjavik, which is also the country’s largest city. There are plenty of great things to do in Reykjavik, with various open-air art installations like the 'Sun Voyager' sculpture and beautiful buildings like the Hallgrimskirkja cathedral definitely worthy of a visit. The city is filled with incredible examples of architecture that you simply wouldn't find anywhere else, as well as offering unique dining opportunities and stores. As well as a lot of unique attractions and reasons to visit, Reykjavik also has a lot of great hostels, catering to the city’s young tourists and budget backpackers. Many of the city’s hostel locations are modern, with some featuring futuristic, pod-style beds and lots of fun features and amenities for every guest to appreciate. If you’re planning a trip to Reykjavik, we’re here to help narrow down your accommodation search. Read on to learn all about the best-rated hostels in the Icelandic capital. As the name suggests, the first thing that stands out about this hostel is its pod-style beds. Unlike many old-fashioned hostels that feature basic bunks, Galaxy Pod Hostel in Reykjavik offers personal pod spaces that offer a lot more privacy and comfort and have proven a big hit with travelers of all ages. This hostel is nicely located within short journeys of many of Reykjavik's top attractions and points of interest like the National Museum of Iceland. Dorms are either female-only or mixed-gender and all come fitted with comfortable bed linen and secure lockers to keep your belongings safe. There's also a movie room to chill out with friends or a bar to have some drinks, as well as a laundry room, computer area, and equipped kitchen, but it's important to note that breakfast isn't included with the room rates at this hostel. In downtown Reykjavik, very close to many of the city's eateries, bars, stores, and landmarks like the Hallgrimskirkja cathedral, Reykjavik Hostel Village is waiting to welcome you in. As the name suggests, this hostel is actually like a little village, incorporating multiple little houses and buildings that have been converted into comfortable, affordable accommodation. Mixed-gender dorms and private rooms are available, all featuring shared bathrooms, high speed internet access, and tea and coffee making facilities. There's also a private suite for guests in need of more space and privacy. Breakfast isn't included in the room rate but there is a buffet served on site if you're willing to pay a little extra. Not only that, but this pet-friendly and family-friendly Reykjavik hostel also organizes regular BBQs around the village and provides bike rentals for guests to explore the city too. If you're looking for an elegant, modern hostel that really sums up the style of Reykjavik, Hlemmur Square is the place to be. Housed in a lovely art-deco style building that was constructed back in the 1930s, this hostel is only a short walk away from some of the city's top sites like the Hallgrimskirkja cathedral and Laugavegur, one of the best shopping streets in Reykjavik. Lots of great eateries are found nearby too, along with the on-site bar and restaurant. Dorms and private rooms are available. The dorms are simple but clean, with bunk beds and privacy curtains. Private rooms are modern and stylish, fitted with mini-bars, TVs, and high speed internet access. Some of the rooms even come complete with balconies, offering beautiful views of the city and surrounding landscapes. Live entertainment is scheduled at this hostel regularly and there's a library on-site too for people who prefer something a little calmer.